Guest post by Jessica F. Green, assistant professor in the Department of Environmental Studies, New York University. This post is adapted from the longer original version published last month in Nature. 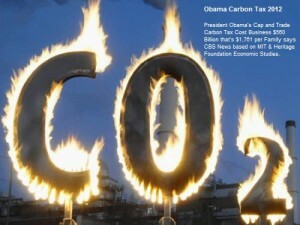 Carbon trading programs are pro­liferating. These allow companies to buy and sell the right to emit carbon dioxide. The European Union’s Emissions Trading System cov­ers 11,000 emitters across all EU member states, as well as Norway, Iceland and Liech­tenstein. California and Quebec share a mar­ket, which Ontario, Manitoba and provinces in Brazil and Mexico plan to join. China is due to launch its national cap-and-trade sys­tem later this year, comprising 7,000 emitters. Around 100 nations have said they are planning or considering carbon pricing to reach their emissions-reduction goals in the 2015 Paris agreement on climate change, according to the World Bank’s State and Trends of Carbon Pricing 2016 report. These pricing plans include carbon taxes and trading schemes. Many policymakers are urging that cap-and-trade programs be linked together in a global carbon market. According to prevailing economic theory, linking markets together should promote trading, smooth financial flows and lower the overall cost of reducing emissions. A global price on carbon emissions would emerge without the need for long and fractious diplomatic negotiations. But reality is more complicated. Initial attempts to join up trading schemes in Europe, California and Quebec have led to price crashes and volatility, not stability. It is becoming clear that cap-and-trade works only under special circumstances — when one entity controls the market and parallel initiatives do not undermine it. Single carbon markets are difficult to manage; this becomes even more challenging when many regulatory authorities compete in linked markets. Interactions with other climate policies trigger unintended outcomes. Policymakers find it hard to keep prices at the ‘right’ level — neither so high that a carbon market becomes politically unaccep­table, nor so low that it fails to change behav­ior. As I show below, California’s case shows that lawmakers can be tempted to use regulatory loopholes to drive down prices and weaken the mar­ket’s effectiveness. Such problems will only worsen when more markets are linked up. So, policymakers should keep it simple. A truly global carbon market would need a central carbon bank to manage allowances and prices. But that approach seems unlikely in today’s political climate. In the absence of such a body, national and regional carbon markets should maximize their autonomy, manage their own prices and regularly ratchet down the caps on total emissions. Prices must be kept high and regulatory loopholes avoided for net emissions to fall. Proponents of carbon markets often trumpet the success of the US Acid Rain Program. In 1990, the Environmental Protection Agency (EPA) created a nationwide market for sul­fur dioxide. The agency capped the total amount of the gas that could be emit­ted nationally, and gave allowances to power plants on the basis of their past SO2 emissions. The plants could then trade these allowances. Between 1990 and 2004, the sulfur cap-and-trade program reduced US SO2 emissions by almost 6 million metric tons (“tonnes”), a roughly 35% drop, even as US electricity gen­eration increased by almost one-third. By 2010, SO2 emis­sions had halved again to 5 million tonnes. Compliance was close to 100%. The health benefits alone were estimated to exceed $50 billion a year — a bargain, given that the program’s annual administration costs were about $0.5 billion. Enthusiasm grew for cap-and-trade mechanisms to manage other pollutants. During the Kyoto Protocol climate nego­tiations in the late 1990s and early 2000s, the idea of an international carbon market took hold. The protocol created the Clean Development Mechanism (CDM), which in 2005 became the first global exchange for carbon offsets, allowing countries to receive credit for financing emissions-reduc­tion activities out­side their borders. The same year, the EU created its Emissions Trading System, which it linked immediately to the CDM. This allowed companies to pay for offsets abroad through the CDM as a way of meeting their EU emissions quotas. But the Acid Rain Program was a special case. It ran under the sole authority of the EPA. 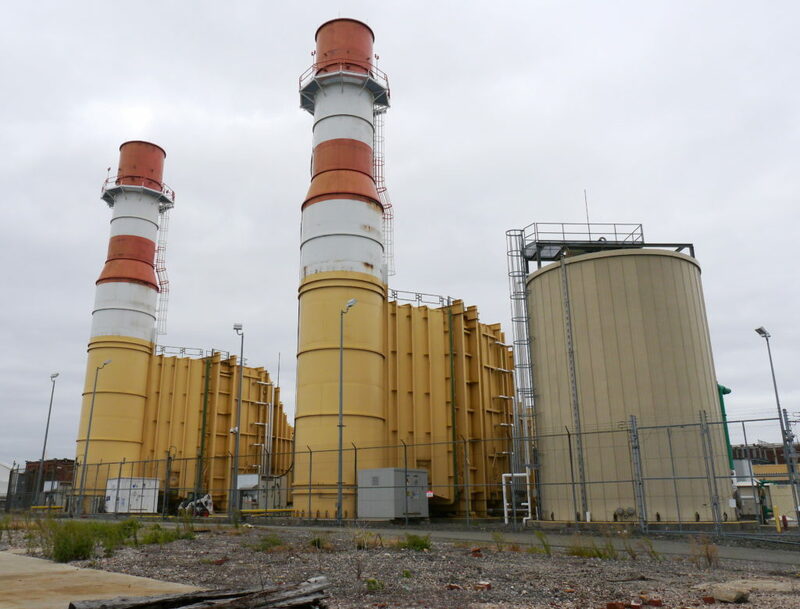 Power plants that did not comply faced onerous financial penalties: $2,000 per tonne of emitted SO2, compared to €100 (US$106) per tonne of CO2 for the EU-ETS. Moreover, the EPA program began as a closed regulatory system. Policymakers delib­erately avoided adding other policies such as technology requirements or performance standards to reduce SO2 emissions. By con­trast, carbon markets are influenced by other policies on climate change and energy. The second phase of the Acid Rain Program shows how problems arise when a closed regulatory system is opened up. In 2005, the EPA created the Clean Air Inter­state Rule to target nitrogen oxides, too. This tightened the cap on SO2 emissions, widened the program to cover more US states and made trading optional. The changes led to a spike in prices. At the same time, a number of downwind states sued the EPA on grounds that the changed rules were too lax. The suit was successful and gave rise to new regulations. The market became volatile and, eventually, irrelevant. Now, SO2 trades at a few cents per tonne. Emissions continue to fall, and are down more than sevenfold from 1990 levels. The rise in supplies of natural gas and increased availability of low-sulfur coal also played a part. Attempts to join up carbon markets have faced similar challenges. There are two notable examples: the EU-ETS link with the Kyoto Protocol’s CDM, and California and Quebec’s shared market. In mid-2008, EU-ETS carbon prices plum­meted from roughly €25 to less than €10 per tonne of CO2. They have yet to recover — a permit to emit a metric ton of CO2 now trades at around €5. The main reason is too many allowances. After the financial crisis, falling industrial output coupled with changing environmental poli­cies lowered emissions across Europe, leaving power plants with allowances to spare — further exacerbating the problem of excess allowances. Joining the CDM added more emissions credits to a system that was already awash with them. The European Commission has intro­duced reforms to reduce the glut. In 2011, it barred certain CDM offset cred­its, starting in 2014. The most significant prohibition was on credits for destroying the potent greenhouse gas HFC-23, a by-product in the manufacture of the refrigerant HCFC-22. The CDM had already unwittingly created a perverse incentive, as legal scholar Michael Wara pointed out: companies had been generat­ing more HCFC-22 to capture offset credits from destroying HFC-23. Worse, when these credits were banned, they flooded the mar­ket as firms rushed to sell them before they became worthless. Businesses banked their other allowances, lowering demand further. Despite this and other steps, European carbon prices remain low and oversupply is unsolved. In February, the European Par­liament voted to accelerate the tightening of the cap on emis­sions, from the current annual decrease rate of 1.74% per year, to 2.2%, but that won’t start until 2021. California is also experiencing low demand for credits, and low carbon prices as a result. The scheme launched in 2013 as part of the state’s suite of policies for achieving its ambitious emissions-reduction goals. It was an open regulatory system from the start, and interacted with other climate-related poli­cies. Prices are higher than in Europe because there is a price floor below which carbon allowances cannot be sold (currently around $13 per ton). In the most recent auction, in Feb­ruary, only 18% of available allowances were sold. In 2014, California and Quebec began pooling their allowances through joint quar­terly auctions, but this has only spread California’s carbon-trading woes to Canada. Nevertheless, Ontario’s carbon market, launched at the start of 2017, intends to link with that of California and Quebec, although no date has been set. The provinces of Acre in Brazil and Chiapas in Mexico plan to join during or after 2018. 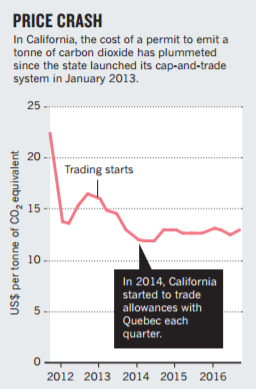 Neither the EU’s nor California’s effort at linking has delivered a strong carbon price. Links only make carbon markets more interdependent, and thus sensitive to changes elsewhere.. It is difficult to escape the conclusion that carbon trading is more a political fix than an effective way to mitigate climate change. Without stringent caps and careful management, cap-and-trade sys­tems have scant effect on net emissions. For example, Californian law allows electricity providers to meet the emissions cap by buy­ing energy from sources outside the state. Instead of buying dirty energy, from, say, a high-emissions Nevada coal plant, providers can swap to cleaner sources (an Oregon nat­ural-gas plant, for instance). Although the Californian utility is emitting less by using energy from a cleaner source, a non-Cali­fornian utility will still buy the dirty energy. The result of this ‘resource shuffling’ is lower emissions in California but no net change in US or global emissions, as energy economist and legal scholar Danny Cullenward has pointed out. A central carbon bank could solve many of these problems, in part by adjusting the supply of allow­ances to prevent price volatility. But creating a new international institution — and insulating it from political influence — is a tall order. In the meantime, I offer three suggestions. Policymakers should limit links to other markets. China’s national market will be the largest in existence when it launches this year. It should postpone linkages to other cap-and-trade systems. Policymakers should also reject offsets from other jurisdic­tions. The EU-ETS should expand its list of barred credits to include more, or even all, CDM projects. Policies should be designed to avoid over-allocation and ensure rising prices. Regulators should establish institutions to insulate the allocation process from political pressure. The forthcoming EU-ETS Market Stability Reserve could be a promising start in protecting the European cap-and-trade program from member-state influ­ence. Policymakers should eliminate loopholes that limit the environmental effec­tiveness of cap and trade. For example, the “resource shuffling” noted above was barred in California’s initial regulations, but was later allowed in under pressure from utility companies. The result has been outsourcing of emissions rather than net reductions. The worst possible outcome of linked markets is a set of policies that appear to address climate change but allow emissions to continue to rise. The Yale climate economist William Nordhaus goes after Pope Francis in the current New York Review of Books on the question of how best to prevent global warming. But after landing a few solid punches, he collapses in a muddle all his own by obscuring the difference between carbon taxes and cap-and-trade. The principle of the maximization of profits, frequently isolated from other considerations, reflects a misunderstanding of the very concept of the economy. As long as production is increased, little concern is given to whether it is the cost of future resources or the health of the environment; as long as the clearing of a forest increases production, no one calculates the losses entailed in the desertification of the land, the harm done to biodiversity or the increased pollution. In a word, businesses profit by calculating and paying only a fraction of the costs involved. ¶195. To be sure, resource losses are chronically under-estimated. But Nordhaus maintains that the pope misses an important point, which is that the problem is not markets per se, but markets that are poorly designed and hence encourage the wrong kinds of activity. Putting a low price on valuable environmental resources is a phenomenon that pervades modern society. Agricultural water is not scarce in California; it is underpriced. Flights are stacked up on runways because takeoffs and landings are underpriced. People wait for hours in traffic jams because road use is underpriced. People die premature deaths from small sulfur particles in the air because air pollution is underpriced. And the most perilous of all environmental problems, climate change, is taking place because virtually every country puts a price of zero on carbon dioxide emissions. The strategy of buying and selling “carbon credits” can lead to a new form of speculation which would not help reduce the emission of polluting gases worldwide. This system seems to provide a quick and easy solution under the guise of a certain commitment to the environment, but in no way does it allow for the radical change which present circumstances require. Rather, it may simply become a ploy which permits maintaining the excessive consumption of some countries and sectors. ¶171. Although Francis is probably talking about cap-and-trade, Nordhaus is not so sure since “carbon credits” is not a term that practitioners usually employ with regard to the trade in carbon emissions. So he argues that “this part of the encyclical is clearly a critique of market-based environmental approaches”— all such approaches, that is — a category that in his view includes both cap-and-trade and carbon taxes. Wrong. Cap-and-trade clearly is a market-based solution because it creates new arenas for the buying and selling of emission permits, complete with futures markets and financial derivatives. But a carbon tax is not. Instead of creating new ways of buying and selling, taxing carbon is a form of direct behavior modification not unlike a traffic fine or a golf-course fee. Instead of encouraging speculation, it does the opposite by making it crystal clear that economic actors will have to pay a set premium for every unit of carbon dioxide they emit. So while the pope may have gotten a good deal wrong, this is one thing he gets right. Not only does cap-and-trade promote speculation, but Francis is correct in pointing out that, in practice, it has done little to reduce emissions or encourage fundamental technological change. Setting a strict limit on greenhouse gases and then allowing investors to bid on emissions rights up to a certain level is music to the ears of neo-liberal economists for whom there can never be enough markets. But implementing such a program has proved a nightmare. Due to heavy lobbying by corporations and politicians, the EU’s Emissions Trading System, the largest carbon market in the world, exempts 55 percent of greenhouse gas emissions, according to the Greek economist Andriana Vlachou. Since the system leaves it to individual member states to estimate their emissions, over-reporting has been rife. Offsets, the practice of allowing member states to reap credits by sponsoring carbon-capture projects such as new forests, have been especially problematic. As the Carbon Tax Center’s James Handley has pointed out, estimating savings from such projects is difficult, while verifying that developers are telling the truth about the benefits is even worse. Volatility is another problem. After the EU allocated too many permits, prices plunged so low in 2013 that officials had to take 900 million permits off the market. Since trading is electronic, hackers have meanwhile made off with millions. It’s the sort of system that only a free-market Chicago economist could love – and, given the opportunities for corruption, maybe an old-school Chicago politician as well. By comparison, a carbon tax is the essence of simplicity. Administrative costs, which involve little more than calculating the carbon content of a given fossil fuel and then levying a charge “upstream,” are minimal. So are enforcement costs. There are no offsets, no complicated negotiations to determine each nation’s emissions quota, no wrestling with entrenched political interests to determine which industries are covered and which are not. While Vlachou reports the EU’s cap-and-trade program weighs especially heavily on poor electricity users, such consequences can be easily mitigated in the case of a carbon tax by earmarking revenues for social programs, investment in poor neighborhoods, or reducing income taxes for lower earners. Nordhaus is not the only one to blur the difference between a carbon tax and tax-and-trade. Cass R. Sunstein, the Harvard law professor and recent Obama operative, recently made the same blunder in a column defending not only markets but consumerism and economists in general, who, he assures us, are “excellent technicians” and “pretty decent moralists” as well. The pope is not the only one who finds this difficult to swallow. Suspicion of market-based solutions may not be so unjustified after all. Who’s “Out of Step” on Climate — Pope Francis or Harvard Expert? [W]here Francis’ environmental and economic agendas meet, he leaves something of a paradox. . . While urging swift action to curb the burning of fossil fuels that have powered economies since the Industrial Revolution, he also condemns the trading of carbon-emission credits, saying it merely creates new forms of financial speculation and does not bring about “radical change.” But carbon trading is the policy most widely adopted by governments to combat climate change, and it has been endorsed by leading economists as a way to cut carbon pollution while sustaining economic growth. Two new autopsies of the failed 2008-10 effort to pass comprehensive climate legislation are deservedly generating buzz: the commentary includes posts in Grist by David Roberts (3 posts), Bill McKibben, Eric Pooley, and Joe Romm, in Time by Michael Grunwald and a Washington Post interview by Brad Plumer. The heftier of the two reports, weighing in at 145 pages, is by Harvard Poli Sci Professor Theda Skocpol. Her exhaustive but riveting narrative, “Countering Extremism, Engaging Americans in the Fight against Global Warming,” is a pointed rebuke to complaints by Big Green leaders like EDF’s Fred Krupp and NRDC’s Dan Lashof that President Obama’s decision to tee up health care reform first spelled doom for cap-and-trade legislation. Skocpol contrasts the extensive grassroots network built to educate the public and support health care reform with green groups’ obsessive insider-dealing to win backing for cap-and-trade from fossil fuel interests. She cites a May 2009 Rasmussen poll conducted on the eve of the House vote on the 1400-page Waxman-Markey cap-and-trade bill showing that more than three-quarters of respondents had no idea what cap-and-trade meant. [Skocpol, p 53]. The other post-mortem, “The Too Polite Revolution, Why the Recent Campaign to Pass Comprehensive Climate Legislation in the United States Failed,” is by journalists Petra Bartosiewicz and Marissa Miley. Their report offers juicy details from the months of heated back-room negotiations by the Big Green-led US Climate Action Partnership (USCAP) to win support from the polluters whose emissions would be “capped” by Waxman-Markey. Like Skocpol, who relied heavily on Bartosiewicz and Miley’s interviews and research, they urge greens who want effective climate policy to start by building, or tapping into, a strong grassroots movement. At this point, you may be tempted to tear up Skocpol’s paper in frustration. We certainly were. In dismissing prospects for building a carbon tax into comprehensive tax reform, Skocpol has rejected the possibility that a transparent, understandable proposal can spark the public education and movement-building that she herself forcefully advocates. In contrast to the opacity and complexity of cap-and-trade – a policy practically built for back-room dealing – a simple, transparent economy-wide tax on carbon pollution can be explained as a way to offset fossil fuels’ artificial advantage over energy efficiency and renewable energy. Moreover, if the alternative to a carbon tax is higher taxes on productive activity such as work and investment, might not the public, and even some Republicans, be supportive? Some anti-global warming reformers fantasize that the second Obama administration can act freely through the EPA without worrying about Congress or national popular support… Even bold regulatory steps by the EPA – such as using its authority under the Clean Air Act to crack down on existing coal-fired electric-generating plants – are likely to be blocked or undercut as long as GOP radicals have major leverage in Congress. Both Skocpol’s and Bartosiewicz & Miley’s post-mortems conclude that cap-and-trade was killed by a collision with intransigent Republicans, abetted by the folly of Big Green’s attempt to buy off polluters. They call for a broad movement to support a cap on greenhouse gas emissions and suggest it could be built on distribution of auction revenue to the public via a “dividend.” But their autopsies overlook another insidious poison: the duplicity inherent in advocating an emissions “cap” while denying that unless revenue return is included in the legislation, cap-and-trade is a hidden, volatile and regressive tax collected and securitized by Wall Street traders. The real lesson of the Waxman-Markey debacle is that cutting deals with polluters while hiding the price doesn’t work. How about, instead, a genuine public education and organizing effort with a full-throated call from the environmental community for a substantial, briskly-rising tax on carbon pollution, with no exemptions?